We got productive this weekend, started our laundry area redo and also completed some of the projects that have been lingering around for a while. One of those projects being a little sprucing up of our little half bath. So let's take a walk through memory lane and see how far this teeny space has come. Nice huh? This was such a dingy and dark little space. When we moved in, we at least added an old rug we had, tossed a basket under the sink for storage and moved the plunger. Big upgrades, I know. And....here it is today. So much better right? 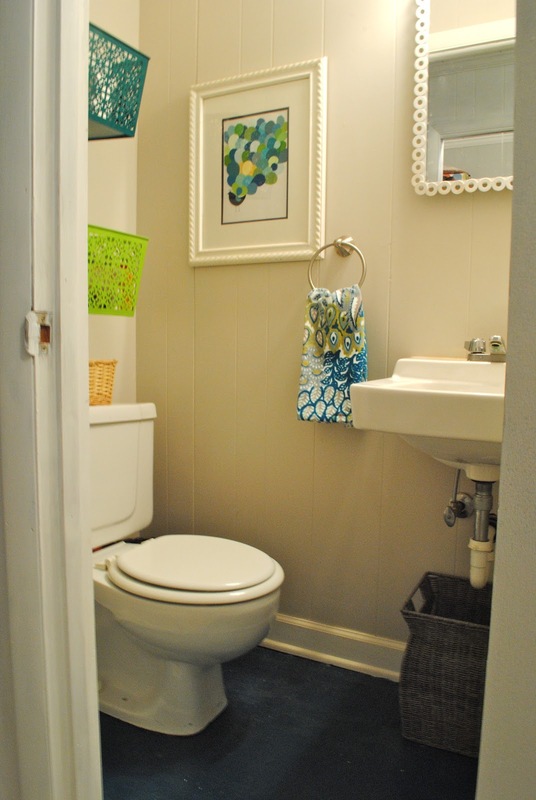 This little bathroom is so much brighter and cheerier and is full of easy diy projects. Here are some things we have done so far: We painted the trim white and walls a new brighter color (Olympic Tightrope). Then we painted the linoleum floor teal (Valspar Classic Teal)- a much easier process than I thought it would be. We also added these baskets for extra storage on the walls. And, I made the peacock paint chip art (which we finally got around to hanging this weekend). 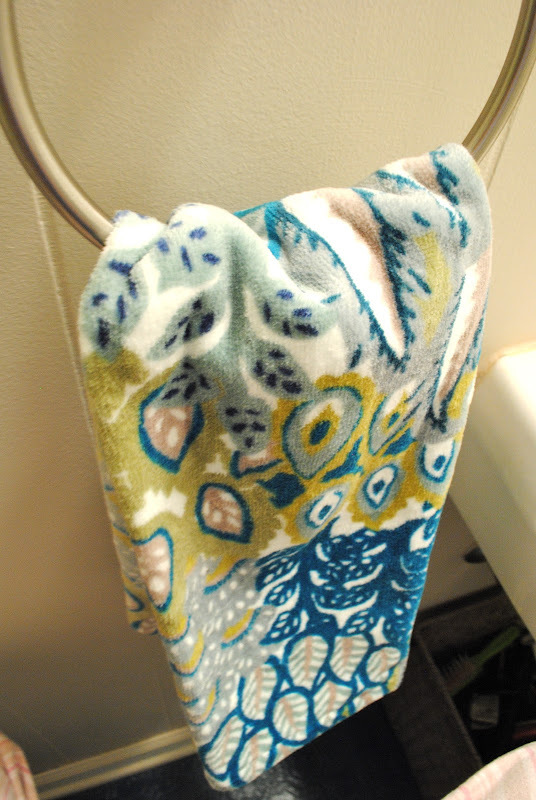 Oh, we also changed out the awful old and broken wooden towel rod and this weekend I found this really cute hand towel at world market - that I absolutely love. PS - You can see where I have started priming the hallway and laundry area this weekend plus you are reminded of how hideous that floor is back there. We also replaced the old light and updated the old medicine cabinet mirror. We love our new little space! I'll be sharing more laundry room updates as well as some other little projects we are working on this week. Thanks for stopping by today, have a great week! 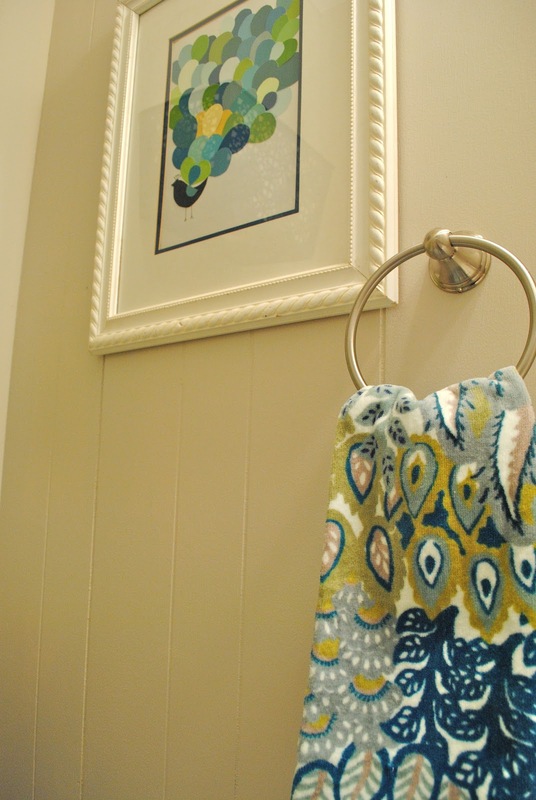 The containers, paint chip art and hand towel compliment each other so well! That hand towel is THE JAM (to use your word, LOL)!!! Looks great! Haha, thanks! World Market has some seriously cute towels right now - I wanted all of them. I think you did a great job with renovating the bathroom! It makes it look much more cheerier:) I just found your blog from the Blog Hop and I hope that you could check out my site! This is adorable! 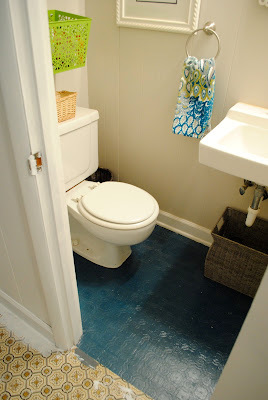 I had no idea you could paint linoleum - definitely filing that away for future use! Oh what an awesome job you all have done on your bathroom. I found your blog through the hop. Glad I did. I love the feel of the new space! Those colors just really brighten up a space! Awesome job! 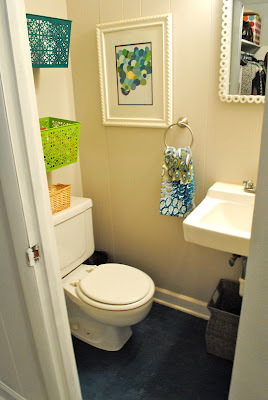 I'm all full of ideas now, I never thought a small bathroom could look so cheery! Love it! So bright now, and I love the shades of green and blues. Perfect! Visiting from the blog hop. Such a great transformation! I love the painted floor!! Found you at the blog hop and am now a follower. Have a great day! Wow! What a difference...it's just amazing! I'm a new follower from the blog hop! What a lovely redo! Happy new follower from the hop. I'm following you from the hop! Looking through your remodeling pics makes me miss when we were remodeling our house! It's so fun and stressful but I would do it again in a heartbeat!! Oh and your sons name is ADORABLE!! Wow! Just $100?! That made such a difference! Nice work! Nice job on the update! I found you via the blog hop and would love for you to come over and see my bathroom reno. Thanks!